The exhibition he referenced was the result of an imaginary exercise called “The HuB Design Competition.” Sponsored by the Charleston chapter of Architecture For Humanity, the competition challenged designers to create a new 50,000-square-foot transit hub, to be built on the surface parking lot at Meeting and John streets next to the Charleston Visitor Center, with offices, retail, meeting, and green spaces and the ability to serve light rail, tourists, bus riders, and cyclists. 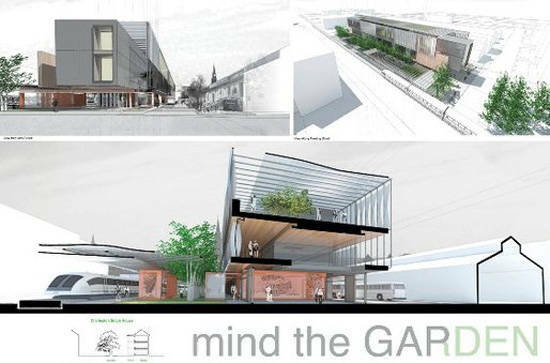 “Mind the Garden” by David Hill and Laura Garofalo of Tonic Design + Tonic Construction in Raleigh, NC. The prize: $1250. “The winning entry, from Tonic Design of Raleigh…would aim to create a vibrant city space not by making a monumental building — like most train stations of the past — but an urban garden that commuters and city dwellers could use,” wrote Behre when he announced the winners. “Mind the Garden” is a vessel and stage that would sustain and enrich local culture. The bar building’s bays, at the ground level, would create market (retail) stalls for regional goods, such as Gullah baskets and farmers’ produce. The designers took some of their cues from the historic Charleston Single Houses that offer compelling models for environmental sustainability, but their enclosed gardens privatize green space and do little to encourage public encounters. The “Mind the Garden” scheme would break down the garden-wall barriers to make pleasant, welcoming green space and provide a threshold to introduce local culture to Charleston’s visitors. Small pavilions for waiting, cafes, ticketing, and vending would occupy and invigorate the garden platform. The green space functions simultaneously as a pathway, a place of rest, and a surface for activity, while making connections beyond the site, coupling axially with Wragg Square to the north and east. The winning entries were displayed in the windows of the former Millennium Music store in downtown Charleston.